WYC B14s and Musto Skiffs take on the best…. Update from Mark Marnes: B14s and Musto Skiffs attend Stokes Bay TTs. Whitstable Yacht club members take on the best at Stokes Bay in very tricky conditions. B14s: Eight races 5 different winners. Mark Barnes/Pete Nicholson, won a hard fought series by 2 points from Nick Craig/Steve Dunn (Frensham Pond) and Tim Harrison/Jonny Radcliffe (Harwich Haven). Musto Skiffs: Six race winners in the 8 race series. Andy Peake led the event going into the last race but with difficult conditions, had a mediocre result and lost out to Dan Henderson (Thorpe Bay) by 2 points and beat Richard Stenhouse (Rutland) on countback. Graeme Oliver 7th, Simon Reynolds 10th and Sergie Samus 28th also attended with some good results. Just a reminder that we are collecting these vouchers. I plan to give these to the Cadet Class Captains to spend after the closing date. We have already banked several hundred vouchers last year which will be added to those collected over the next few months. As they say...."every little helps"!!! Melanie. Some boat insurances stipulate that boats must be tied down when on the beach. If you need to move a boat that is tied down would you please retie it, as not to do so might invalidate the insurance. Many thanks. I apologise as I know this is hardly newsworthy but I would appreciate it if members could ensure "for sale" notices are of a sensible size. I have been inundated with A4 advertisements and there simply isn't enough room. Please also be reminded that notices should come through the office first to be date stamped. I am really trying to keep our notice boards tidy and easy to read! Many thanks. Melanie. 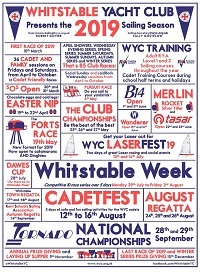 With reference to my previous posting, the rowing event is scheduled to take place on Saturday 23 May at Herne Bay Rowing Club - watch this space for start times. Melanie. ......two boats blew over - please make sure you tie your boats down properly after racing!! Thanks WYC. Start the season as you mean to go on…. The first Wanderer Open Meeting of the season was at Crawley Mariners YC last Sunday, 15th March. Three Whitstable boats travelled over, Mark Fagg crewed by Ian Hender, Chris Partington with Donna Hender and Gavin Barr with Mark Skipper. There was a total of 9 boats. The weather was very light and shifty, giving a completely new meaning to the phrase "fickle winds"! Gavin and Mark had to struggle hard, but managed an overall win. A great start to the season - long may it continue!! Well done to Madeline who won the UNDER 16's category after a nail biting finish against Luke Clarke....girl power rules! Ever quick off the mark, Chris Leamon proved a worthy winner and beat the adults. Another really sucessful event and a great time was had by all. We also raised £15 for the Club - so thanks to those who attended. Watch this space for details of the next event. We had a superb turnout of volunteers for the working party on Saturday. Thank you to everyone who gave their time and talents. We achieved everything we hoped to do - and more besides. Now it's fingers crossed for a good sailing season. Jason Wild, Commodore. The Tea Bar will re-open for the sailing season this Sunday at 11.30am. Going forward, weekend Tea Bar opening times will be as follows: 11am Racing - 8.30am to 2pm. 2pm Racing - 11.30am to 4.30pm. We have a great selection of food with the welcome addition of a pie warmer with a selection of hot pies, pasties and sausage rolls. I look forward to seeing some familiar faces so please come along and say hello. Christine (Catering Manager). The guide for race officers has been updated and expanded to include committee boat starts. 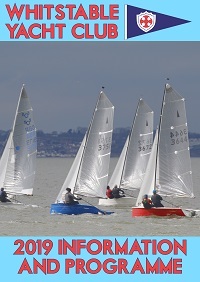 There will be a copy in the race hut and one on the committee boat – both to be left in situ please. There is also a copy in the club office which may be borrowed but must be returned. The guide can be downloaded in PDF format from the MEMBERS section of the WYC website. Contact the office if you have some news. Email office@wyc.org.uk.